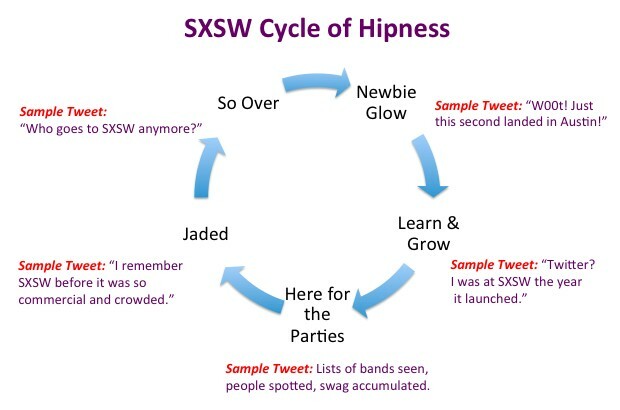 SXSW 2013 sparks up March 8 – 17 with sessions on everything from indie film and music to emerging technologies. The full conference schedule is available here. 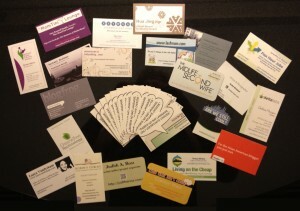 My new business cards surrounded by some of the dozens I’ve collected at BlogHer ’12. 1) Break Out of Your Introvert/Extrovert Mold – I’ve written here before about my extreme introversion. Being an introvert isn’t the same as being shy; it has more to do with how much input you can take before you need to recharge your batteries in a quiet, secluded place. Conferences present constant social and information overload for us “I” types. Normally, this much input makes introverts retreat into their shells or hide behind their smartphones. I’ve spotted a few of us today. Here’s the thing (and I say this with love), when we give off the Don’t Approach vibes, when we Cold Shoulder, when we give tablemates the Silent Treatment, it tends to make fellow conferees uncomfortable. Sure, it’s not our intention, but we risk being branded as standoffish, and we lose out on opportunities, like networking, meeting potential brand sponsors for our blogs, and hearing about job openings. I have no idea what it’s like to be a social butterfly, but in the interest of equal time, if you’re drawn to the parties and after-parties at conferences, maybe this time set aside the final night for your Little Black Dress. On the first day(s) of the conference, take your social skills to the early morning networking breakfasts. Your extroverted self will shine like a star and, for the rest of the day, you’ll discover what it’s like to attend panels without a hangover. Who knows? You might learn something you otherwise would’ve missed while sawing logs at the post-lunch session. 2) Find a New Posse to Hang With – A VP at a former job was generous in sending her team to professional development conferences. She had one request: We couldn’t eat lunch with our colleagues. We had to wander the luncheons like nomads and join a table of complete strangers, network and learn and share. Long before social media – or the Internet – she understood the value of engaging. Sure, it was risky. We could have networked ourselves into new jobs for competing companies. But there was an equal or greater chance we’d return renewed and inspired and share what we’d learned, improving our own campaigns as a result. 3) Zip It – There’s an unfortunate trend among conference-goers that involves talking almost nonstop through sessions. There’s no question: This is utterly rude and disrespectful to the speakers and everyone else who’s paid a significant amount of money to listen and learn. People who don’t have the capacity to sit silently through a 90-minute talk don’t belong there. Sure, there’s that last-minute presentation that needs to be multitasked during a panel discussion or the babysitter who has to be able to call no matter what you’re doing. Be graceful enough to recognize that this behavior is disruptive (and never, ever argue when someone asks you to be quiet). That work project, that ringing cellphone, that gossip about a brand that wants to sponsor your blog? As important as they seem, they’re relevant to you and you alone. Gather your things and leave as unobtrusively as possible, even if you just need to take a short phone call. Conferences are places where you’re expected to bring your best professional self – along with basic manners. Manners aren’t some outmoded ideal, they’re about demonstrating respect for yourself and those around you. When you share your best self, you’ll find you’re the recipient of networking opportunities you never dreamed of. 4) Get Carded – Like a lot of BlogHer attendees, I got all hepped up about creating a new business card for the conference. You give away stacks of these babies at an event like this, and collect just as many. Some are all business; many as glib as punchlines; others wonders of design. We spend hours fretting over how to present our personal brand, company offerings and blog personalities. But, after I’d handed out a bunch, I realized I’d blown it. I’d shared my blog URL, my tagline, skill sets and contact info. What I should have done was talk about what I or my blog could do for others. Note the subtle distinction: I assumed I had the WIIFY covered by listing my skills like this: writing, social media, corporate communications. 5) Learn Something Completely Unexpected – We were reminded today at the newbie breakfast that it can be more beneficial and inspiring to attend a session on a topic you know nothing about, that takes you out of your comfort zone, that throws you in with people whose ideas, skills and ways of working are nothing like your own. You may feel lost, challenged, afraid someone will call on you, lonely, and/or confused, but you’ll emerge thinking about things in new ways and feeling renewed when you return to your own area of expertise. 6) Practice Real-World Engagement – All of these tips are about real engaging, not the type done behind laptops and mobile devices. They’re about approaching these amazing opportunities with your head up, hand extended, ears open, and eyes ready to make contact. They’re about intellectual and emotional connection. Social media folks already spend enough time glued to the glowing screen. A conference is our chance to embrace and practice engagement for real. Who knows what exciting connections we’ll make in the process?